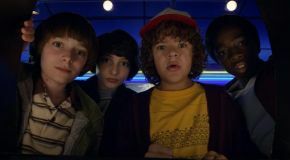 Stranger Things is undoubtedly one of the best shows on Netflix, with its homages to beloved 1980’s movies, a thrilling yet original story and several fun and interesting characters. By the end of its initial eight episodes, we were left wanting more and had several questions as to what would happen next. Fortunately for us, The Duffer Brothers has delivered a second season that lives up to our expectations, which is just as dark, suspenseful and exciting as we’d hoped. It provides us with a thrilling storyline that keeps us invested and introduces a number of cool new characters. The pacing is consistent throughout the nine episodes, which slowly builds us up to what we are going to be let in for. We start off season two by seeing how the characters are still coming to terms with the events of season one, even having the Justice for Barb campaign play an important part this season. In later episodes, we are kept in suspense over Will’s fate and what the Upside Down will unleash onto the characters. Season 2 is undoubtedly much darker than the first, it retains the Steven Spielberg-Stephen King vibe that made the show so great in the first place, but also takes a strong influence from iconic horror and sci-fi films such as Close Encounters of the Third Kind, The Exorcist and the Alien films (even casting Paul Reiser in a role). Whilst there are several relationships on the show that are completely heartwarming, it is the newfound friendship between Steve and Dustin that really charms us all. Their bond provides the humor and lighthearted moments in the rather dark moments, and it was also nice to see a much softer side to Steve’s character and how he has progressed from season one. Noah Schnapp’s role as Will Byers was much smaller in season one, but here he is given more focus and screen time. His ability to swing back and forth between vulnerability over the visions he sees of the Upside Down, as well as the darker side of him when he gets possessed by a large tentacled creature, shows that he is definitely the breakout star of this season. Eleven’s character arc in this season was certainly an emotional rollercoaster ride, as we see her develop a bit of a rebellious streak and starts searching for answers about her past, which proved to be both touching and heartbreaking at the same time. Whilst it was fantastic to see the return of the characters we all know and love, we are treated to some new characters who manage to fit in well with the established characters and battle against the Upside Down. This includes Max, the new girl in town who becomes a part of the group and whilst she’s not as badass as Eleven, she’s likeable enough and has a feisty spirit that helps her to create a great dynamic with the group. Max’s step-brother Billy, who is the new bad boy in town is delightfully fun to hate and they do give some depth to him so that he doesn’t become a one dimensional character, and his feud with Steve Harrington was entertaining to watch. Joyce’s new boyfriend Bob Newby, brings a much needed upbeat vibe that keeps the Byer’s family grounded, and becomes more loveable with every episode, as he eventually becomes the unwitting hero for the group. Sean Astin brought the same optimism and bravery to Bob as he did with his iconic role as Mikey Walsh in The Goonies. Another new addition was Kali, a street thief whose past parallels with Eleven’s, who seemed like a really cool character especially with her powers of illusion, but at the same time her story did seem a little out of place with the other story arcs and wasn’t given enough time and attention for us to become properly invested in the character. Maybe in season three, they will expand a bit more on her character and maybe even have her team up with Eleven again. Stranger Things 2 was well worth the wait, it’s exciting, suspenseful and every bit as good as season one. Purple Revolver Rating: 4.5/5- dark and suspenseful thrills.